Yep, I'm still here and pathetically posting about a movie, of all things, after my extended absence. I've been literally, okay almost literally, buried in projects over the last few weeks. More on that later, but I'm so excited because I'm finally digging myself out tonight for a date with The Husband (who's just returning after being away for a week)! A little alone time with my honey, a little Cheesecake Factory and a little movie called Twilight... ahh. Who could ask for anything more on a Friday night. 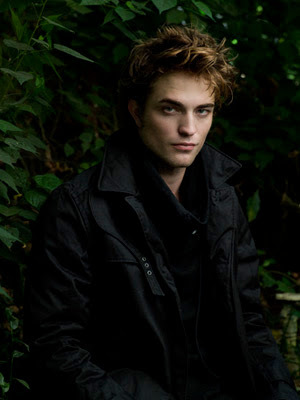 Do you think The Husband will mind wiping the drool off my chin when Edward makes his first appearance in the movie or when I swoon at the first kiss? Eh, hopefully he'll be appeased with all the fight scenes they've built up just for the boys. Goodness gracious and yowza, yowza... happy Friday everyone! i'm excited-but i don't get cheesecake factory-maybe friendly's. bella looks like a vampire in that first picture!